Multiple cities have recently begun to implement revitalization initiatives to bring new life to parks and recreation programs. Jefferson City is one of the cities in Missouri which has begun to attract current and potential residents to its parks through the refurbishment of its trails to runners, walkers and mountain bike riders. 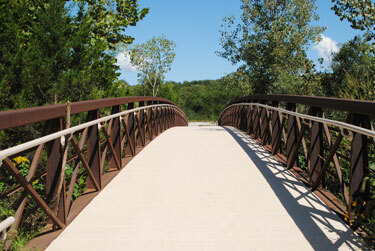 Frog Hollow Nature Trail is a natural, three-mile trail designed for a more advanced runner or bike rider. As the city planned to refurbish and reconnect the trail with adjoining trails and recreation areas they came across a structurally-deficient steel bridge which was deemed unsafe for pedestrians and non-motorized vehicles. As the City of Jefferson Parks & Recreation Commission investigated options, the Westfall Company, Inc. introduced the commission to composite options to aid in the refurbishment of the flooring materials on the bridge. In a previous high profile commercial application, STRONGDEK™ was installed at the Perdido Beach Resort and has endured over twelve years of continuous salt water exposure, and even a few hurricanes. Each American-made STRONGDEK™ panel is made from materials that will not rust, rot, chip or mildew. Panels measure 12" wide and in lengths to form a continuous solid surface with their interlocking design and screw like fasteners. structure gave the bridge a new lease on life while preserving the historical design of the pedestrian bridge for the residents of Jefferson City, Missouri.